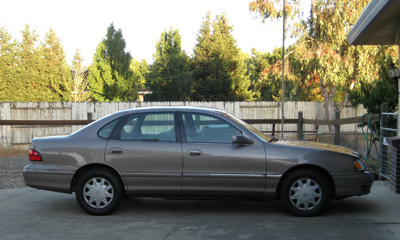 After 15 years of driving my 1994 candy apple red Ford Taurus, the time has nearly come to say goodbye. Part of the San Diego trip, in addition to the wedding, was driving my "new" car home. It's a 1998 Toyota Avalon. I'm not sure what color that is... taupe perhaps? It was my grandparents' car, but my grandpa recently stopped driving, and I inherited the car. It runs great, and though it has a few cosmetic bits of "character" (uh, it bumped into a lot of things in the last year of its previous ownership...) I'm thrilled to own it. I do feel a bit like I'm cheating on the Taurus or something though, this will take some getting used to before I'm accustomed to the Avalon. I have not yet figured out what I'll do with the Taurus. I'd like to sell it, but it's been made clear that having people ("strangers") come look at it isn't going to be allowed here, so I'm kind of stuck. I'm sure no used car place will want to fix up and resell a car that old with that many miles, and selling it for scrap won't put much in my pocket. I've known that car for 15 years, been through a lot of good and bad things with it. You can bet I'm going to be sappy and sentimental and cry when it goes away. If someone spent the money to give it a tuneup and fix the fuel pressure thingamabob that's messing up the mileage, I imagine it's still got some miles left as a commuter car. It was the mileage issue that kept me from driving it much in the last few months. I took the little pickup unless I was in dire need of air conditioning. And I didn't get the Taurus fixed because I knew I'd be getting the Avalon. We also tend to drive our cars until they're about done for, and have the same poor outlook about getting any cash at disposal time. We've found a number of charities that will take these old cars and eke a few more miles from them. All of these charities write a tax deduction receipt for current book value. Not much, but something that's not painful (strangers visiting) and helps someone else. I'm sure your favorite search engine can find charities like these in your area. Nice upgrade! I'm glad you have a vehicle you can rely on now. I love the idea of giving it to charity if you can't find a buyer! Just in time for The Audacity of Taupe.